Tonight on AMC THE WALKING DEAD returns with a whole new episode. We are down to the last three episodes. On tonight’s show called, “Prey” the Governor chases a dissenter who fled Woodbury. While the Governor is gone, a traitor tries to sabotage his upcoming plans. Did you watch last week’s episode? We did and we recapped it here for you! On last week’s show in an effort to prevent any more deaths, Rick and the Governor met to come up with a peace treaty. Things did not go quite as planned and when Rick got to the meeting it was clear that The Governor was not ready to have Rick’s group and his group draw new boundaries. The Governor wanted Rick to surrender. The Governor believed that if he does not stop Rick and his group he will look week. The Governor tried to manipulate Rick into agreeing. The governor also let Rick know if he did not turn over Michonne there was going to be a huge war. On tonight’s show Andrea finally wakes up and smells the coffee and realizes what the governor is, but can she kill him? It also looks like it is Milton who helped Andrea see the light. Milton brings Andrea to a room secretly being held by the Governor, which can only be described as a torture chamber. Milton tells Andrea to go to the prison and get everyone to leave. Andrea is shocked but tells Milton she has to kill the Governor, Milton does not think she can get close enough and she will only get killed. Seeing what Milton has show her has only strengthen her resolve to kill the Governor. But can she do it? We will find out tonight! Tonight’s The Walking Dead Season 3 episode 14 is going to be exciting, and you won’t want to miss it. So be sure to tune in for our live coverage of the new episode of The Walking Dead — tonight at 9PM EST! While you wait for our recap, hit the comments and let us know how know what you thought of TWD’s season 3 episode 13 last week. Check out a sneak peek of The Walking Dead “Prey” below! Don’t forget to come back at 9PM. RECAP: We look back at Michonne and Andrea are in the woods sharing a meal when the walkers they have chained up are getting restless. Andrea wants to know where Michonne got the walkers and she tells Andrea they deserve what they got because they weren’t human to begin with. Present day, in the apocalypse anyway, the Governor is in his torture chamber and looks like the cat that swallowed the canary. The Gopvernor is preparing for a war, Milton is not happy about it and neither is Andrea. Andrea tells Milton that she thought there was a deal on the table and Milton tells her that he is sure it is just a precaution and a show of force. The Governor is alone in his torture chamber when Milton comes in and tells him that he understands this business with Michonne but not the fight against the other people in the prison. The Governor tells Milton that his is revenge for Penny and Milton replies that it doesn’t matter any matter. The Governor’s response, that is all that matters. Milton heads out and warns Andrea that the Governor plans on killing everyone at the prison and she needs to warn them fast. Andrea tells Milton that she is not going to the prison, she is going to kill the Governor herself. Milton warns her that the people of Woodbury are not going to let her near him. Meanwhile, Andrea and Milton are watching the Governor in his torture chamber and she aims to shoot him but Milton stops her. Andrea is pissed that Milton would want to protect the Governor after everything that he has seen. Milton tells her that killing the Governor at this point will not help her friends, Andrea now realizes that she has to warn them. Andrea is heading towards the gate and she has to give up her gun because the Governor wants all the weapons confiscated. Andrea heads over to Tyrese and tells him that Martinez wants them to leave their post because their is a huge bunch of walkers approaching, he doesn’t buy it. Andrea then pulls a knife on Tyrese and tells him that the Governor is up to no good and she is leaving. Andrea jumps over the barricade and is on the run back to the prison. Tyrese tells the Governor that Andrea left and he says he should have shot her to which Tyrese is very surprised. The Governor tries to explain that Andrea is not well and should not have been left to leave. Tyrese is worried, he hopes he hasn’t complicated things with the prison people. The Governor tells Tyrese to go with Martinez to help him out with something while the Governor goes and tells Milton that he is going after Andrea. Milton tells him to let her go be with her people. The Governor figures out that Milton spoke to Andrea and grabs him by the throat in trying to get answers, basically the Governor knows that Milton told Andrea everything. Tyrese and Sasha are getting a little worried about this whole Andrea thing and meet with the two guys from their group but they don’t want anything to do with this whole thing, they are happy at Woodbury and don’t want them to screw anything up. Andrea is running and all of a sudden is taken over by a whole bunch of walkers. Wow, she takes on four and they don’t have a chance against her. Tyrese and Sasha are out with Martinez, the are rounding up walkers to kill Rick’s group. Tyrese wants none of this and gets into a fight with one of this group over the whole matter. Andrea is in the middle of nowhere with the Governor hot on her tail, she hears a pick up truck and throws herself to the ground – he’s found her. Andrea makes it to a wooded area and the Governor decides to back off, for now, he’s not going to get into a foot race after her. Andrea is inside the building and guess who walks in? The Governor. I personally thought he would smash down the door because he is so mad at her, but no, he opens it by the handle. Ok, we know this guy is a mad man, he starts whistling and searches for Andrea who just made some noise when she killed a walker that was coming at her. He whispers Andreas name and tells her to come back to Woodbury because they all need her, it’s her home now. He goes on to say, “their your people, your town, you just can’t leave them all alone”. Then he says “suit yourself” and comes at Andrea with a shovel but she still manages to thwart his attacks. The Governor has gone back to whistling and dragging the shovel against the ground. He is close to Andrea now and turns the wrong way, away from her. The Governor runs in to a few walkers, some he shoots in the face and another he smashes the face in, several times, with the shovel – because it wasnt’ dead the first time ofcourse. Andrea is in trouble, there is a walker nearby, she kills it and heads to a staircase but c an’t go up because it is filled with walkers. This gives the Governor the chance to catch up with her, she opens up the door and lets loose all the walkers on the Governor. Andrea is not sticking around to find out if the makes it, she runs. The Governor shoots, attacks and does anything he can to survive. Andrea makes it outside the building. Meanwhile, somebody is throwing gasoline all over the walkers that Martinez gathered together and set them on fire. Andrea sees the prison and she is happy, but no, it’s the Governor and he pushes her to the ground and covers her mouth before Rick who is on patrol can hear her scream. 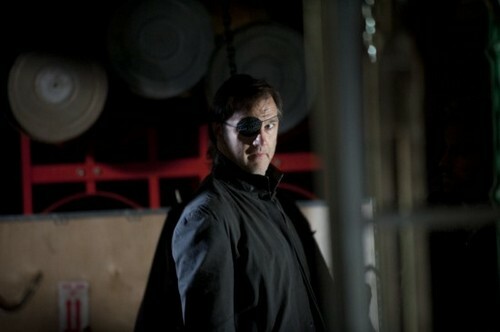 The Governor is back at Woodbury and he has his prey, but tells Martinez that he didn’t find Andrea. Martinez tells the Governor that someone had a barbecue with the walkers and he thinks it was Tyrese and Sasha. The Governor confronts Tyrese and tells him that the walkers was just a scare tactic, Sasha has a hard time believing him. Tyrese tells the Governor that they want to stay and it won’t happen again, now you know that there days are going to be numbered. The Governor turns around and asks Tyrese where he got the gasoline, but figures out quickly it wasn’t them who did it. The Governor then goes to speak to Milton who asks if Andrea is dead, he says he hopes not. Milton then says that it is a real shame about the pits and hopes that he finds out who did it, the Governor says he already has. Inside the Governor’s torture chamber, guess who is sitting in the chair, Andrea.